Aquapalace Hotel Prague is conveniently located by the D1 motorway, in the Průhonice-Čestlice shopping and commercial zone, near the Kika furniture shop. It is 5 km from City of Prague, 34 km from Václav Havel Airport and 17 km from the exhibition grounds in Letňany. For visitors travelling in their own car, there are plenty of parking spaces in the hotel’s underground garages. Visitors to Aquapalace Resort Prague can use two multi-story car parks and outside parking. Guests at Aquapalace Hotel Prague can also use the underground hotel garage which is permanently monitored by CCTV. Fee for parking in the hotel garage: EUR 10/day. Garage also have a recharging station for electromobiles. 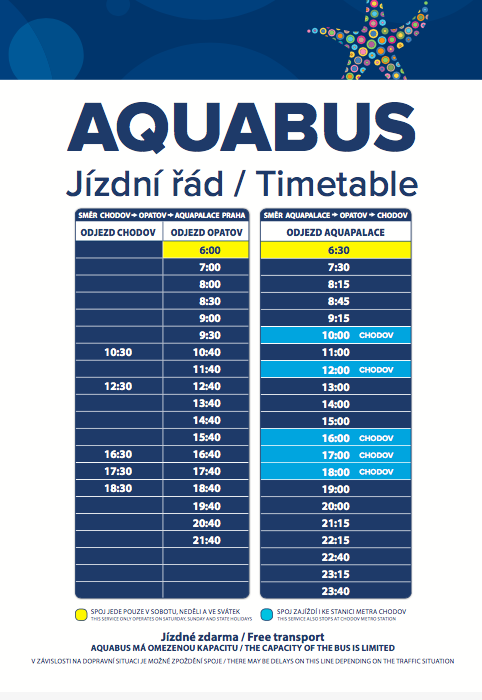 Buses 328, 363, 385 from Opatov metro station (Line C) to bus stop “Čestlice - V oblouku" or "Kika - Aquapalace"
You can also take advantage of transfers by hotel minibus which will provide you with transportation to suit your plans. The transfer price list can be found here.